ABOUT: Grace is a very pretty mare. She is quite anxious and seeks lots of confidence from her handler/rider but has a sweet disposition. 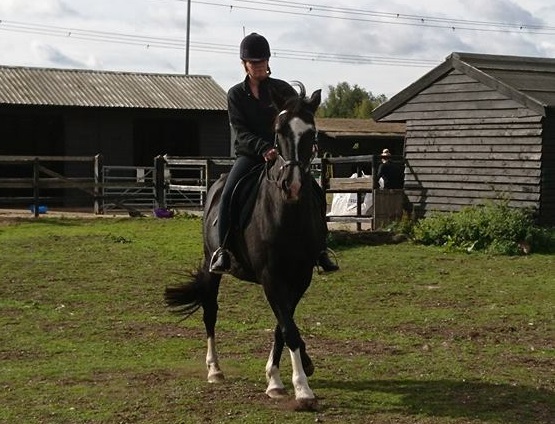 She is ridden bitless in a Micklem bridle and seems to go well with this – she is established in walk and trot, was working on her canter and pole work with her previous foster and is looking for the perfect, knowledgeable foster home. She does occasionally spin under saddle but generally enjoys her ridden work, she loves to pop a jump on the lunge and we hope that she would enjoy this should the perfect foster family come along for her. Grace requires knowledgeable, experienced, firm, kind and patient handling. She enjoys hacking and would excel in the right hands. HISTORY: Grace came into the sanctuary in May 2011. Along with three other horses she had been roaming loose over farmland for many weeks – sadly one of the horses travelling with her was hit by a bus and had to be put to sleep. Grace and her two remaining companions, Riley and Erin, were eventually rounded up by EHPPS and brought to the sanctuary where it was discovered they had serious trust issues and it took weeks to just be able to put a headcollar on them. Riley is now out in a foster home learning to be ridden. Sadly Erin had to be put to sleep shortly after arrival due to the developing cancerous stomach tumours.